Since yesterday, I have been crazy ecstatic about a little discovery I made. Look at this beauty! My mother completely forgot to tell me that there was a typewriter in our apartment. I moved back home more than a month ago and I didn’t know it was here. It was actually at the bottom of MY NIGHTSTAND. I was cleaning up my room and just organizing some things I was postponing and then I just noticed this green case, pulled it out and found this beautiful typewriter there. I remember commenting about it on Twitter with one of the poets I follow and we were actually talking about writing books on old typewriters. I don’t know how much do you believe in signs but I think this might be a sign I should start writing my first book because I’ve been talking about it for ages. I think this is the sign. I am still so happy about finding this typewriter. Tell me if you believe in sign and if you own one of this typewriters. Hope you all are having a wonderful Sunday. I will be working, but I had a great Saturday and I had two days off so I’m feeling full of energy to do this shift today. Make sure to tell me what you have been up to lately, what’s new with you and, obviously, send some more work for The Poetry Bar. Wow, I haven’t seen a typewriter like that for years, what a find. I know, I just love it! That typewriter is a work of art. And yes I do believe in signs. This one is definitely loud and clear for you to start that book. You go girl! 😆@finding it so close to you…in the nightstand. Which, btw, is also a sign that that book is close to your heart. Me? I need focus. That’s my current project. I’ve been wanting to start my book for a very long time and I think this is Universe telling me to stop talking and start writing. Whatever you are focusing on I wish you all the best in your project! That’s very exciting and I think you should definitely write something on it. Lucky you! Oh my. That is gorgeous! I started writing with a typewriter and I still miss it. There is something special about writing on one. Please do write your novel with it! It’s a process most have forgotten in lew of computers. There are subtle differences but I think that’s what makes it enjoyable. Congrats on your find! It’s a beauty! Congratulations, I’ve just begun looking for a typewriter myself. Sadly, there isn’t one hiding in my nightstand. I’ll look forward to seeing what inspiration it provides you! This is definitely a sign of the highest order. 🙂 In high school I had to type on one of those for a grade in Typewriting class. 😀 I had my father’s for the longest time and used it for school assignments and to just type for practice, copying passages from books and the like. Sometimes I wrote little things. It will always be a sign of good things for me. Use it well! Wow nice! I believe in signs. They exist it needs to be! How delightful. I have an Imperial portable the we bought in 82, light and easy, back the we had a Brother electric and an old Imperial. She secretly wore doubts of her choice to return the home of her mother the way any battle ridden warrior does when going back to familiar landscape, the touch of yesterday’s long missed memories and even the conversation over a home cooked meal by Mama. Life can be funny that way, with its secret ingredients found nowhere else. It had been nearly a month when her eyes finally caught site of that- most peculiar contraption sitting off to the side. It was as if the universe rippled in correction, the kind most don’t even notice. One could pose the argument; it was as if destiny was at play here, and that typewriter had been waiting- in silence all this time like a shooting star waiting to be infused with life, life that could only be bestowed from Luna’s fingerprint. Much the way small young girl dreams of being saved by a handsome prince and kissing her back to life; that typewriter certainly could be said to have played the same role, as her dashing prince, except she was the savior and the lost soul and sleeping heart- was her own…damaged by an unwritten travesty. All she had to do was remove the undersize cloth somewhat protecting it from ghostly cobweb collection. After cleaning it up and preparing it for the test, transformion of old dry stale air into a flow of beautiful inked words- suddenly permeated the surroundings of her essence as she began pouring out her heart, her subdued feelings and long hidden dreams. Only she could read her words on invisible paper taking down all she stroked. Every torn scar on her heart slowly disappearing from her divine heart and her memory as time was erasing her unwanted pain. The sounds of the key strokes striking parchment was a symphony written an eon before her birth and even time itself had to wait until that angelic touch from the soul of Luna infused life and color to each phrase, each word- every single letter. Every typed mistake was planned as part of this written marvel, as too was every tearful correction, making it her life renewed in fluid motion. Luna was meant to find that antiquated collection of steel that collected dust of past darken hours, that still worked like some enchanted time machine taking Luna herself back to the old Luna of yesteryear, that same Luna born with mystery and magical hope alive and well in her eyes as her heart pumped out love that like the ink scent adrift in the room where she can be heard clacking away secrets for the universe to bequest and unfold at the promise of every new dawn morning like every virginal flower bursting in a bathe of dew. The kind of secret love recipes Mam’s cook, that changes the world for the betterment. Oh- how I dream to be reborn as her parchment and flooded with the love of…Luna’s ink. This actually brought tears to my eyes. Thank you so incredibly much for this! My pleasure dear friend. Now- go and be…Luna. I hope you don’t mind, but I shared it on the blog. I just really loved it so much and wanted everyone to read it! I don’t mind at all. In fact, I’m humbly honored. 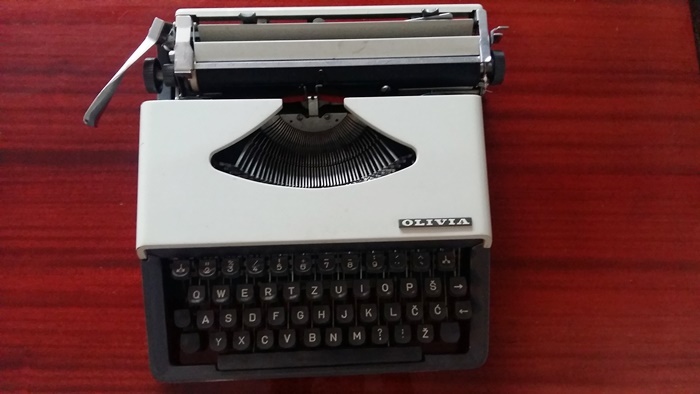 I began my writing, about 45 years ago, on typewriters. Had to re-learn to type my name when modern “keyboards” came along. The apostrophe was previously over the 6, so I could hold the shift key down for O’C, and then release it for the onnor. Now it’s shift, unshift, shift, unshift. I still have an ancient (1940’s?) Underwood or Remington in the attic, and my prize possession, a “Tom Thumb” typewriter, sized and sold for children, in its green steel case. Ahhh….It all starts here now with this find Luna. Getting your work into something tangible – an actual book. If it sounds daunting…don’t worry, yours truly stuck to a page per submit….and have the dubious honour of showing up in twenty anthologies…good luck on the typing. I’d love to own a typewriter like that, but I don’t think I would have the patience to write a book on it! Stylish typewriter, it was meant for you! happy to see your ecstasy in your discovery. i collect typewriters. 30 so far and i type almost daily on them. They create a whole different writing energy. enjoy! What a beautiful machine! Old typewriters are fascinating! I’d say it’s a sign alright. Not necessarily to write on a typewriter. Been there, the lack of ability to easily edit your writing is… frustrating and problematic, LOL. Definitely a sign that somebody up there is encouraging you to chase your dream though. look at it and wish it were working again. Good luck with yours and lots of lovely writing. I love typewriters. I have three, including my father’s old Olympia from the 1970s. There is something magical about them! Decades ago, I used a small portable typewriter all through college – that was before personal computers existed. Writing on the computer is easier, especially for making corrections, but the satisfaction of seeing my words on the page was very much the same. As for a sign? Well, signs are what you make of them. If this moves you forward, then it is a sign; if not, then it never was. Typewriters are the best. I still have mine.